Edited by Minion at 13:34, 19 Feb 2015. But at 8 wins is where we get to the "meat" of the game That is the threshold that starts dropping Epics and Legendaries as cards! So always aim for 8 wins. Edited by blob2 at 14:22, 19 Feb 2015. Edited by Minion at 15:55, 19 Feb 2015. Btw am ranking 6 now, my highest yet. With Priest and Druid, and atm my Priest is totally killing the mecha mages ^^ That is why I am rising I guess! Unless they get Antonidas + Cloak. That is gg beacause I have no answer to that. Currently I auto concede after that, such a joke. Edited by blob2 at 12:51, 20 Feb 2015. So did you guys had any experiences with "Arena Freeze"? I crashed the game once, left it hanging there for a few hours while I was doing something else, came back to it, still was in that game, still lost when I disconnected. I doubt the other game had the patience to sit in limbo with me for so long. How did I crash it? Edited by blob2 at 00:56, 22 Feb 2015. Haha, didn't know that I have seen them at the same time on the board sure, but never seen them both die at the same time! Edited by blob2 at 11:09, 22 Feb 2015. Yeah I decided that I would buy Classic packs as long as I get one card in each pack that I didn't already have 2 copies of. So far have just kept buying Classic packs. And I have only 4 Legendaries, I am not that lucky man. 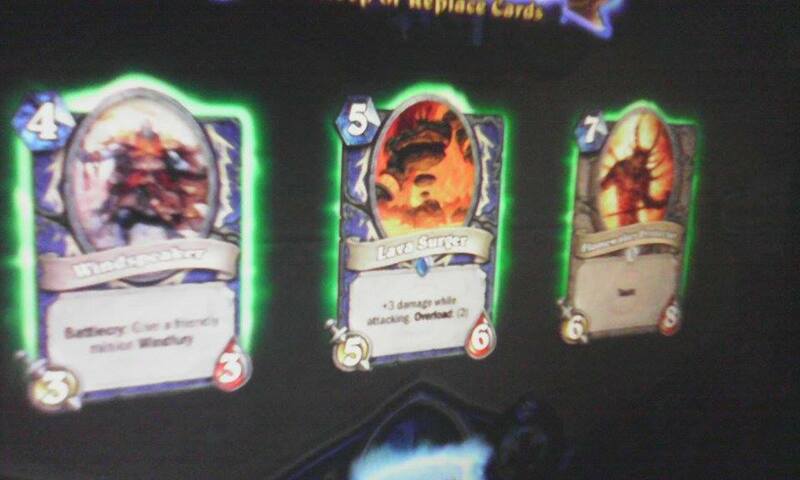 Malygos, Grommash Hellscream, Leeroy Jenkins and Cenarious. I made a Mech-Shaman, because it doesn't need Lightning Storms which I lack ^^ I didn't think you could do any deck without those cards but the Mech-archetype doesn't need board clears o.O Building decks is pretty fun with incomplete card lists, must find the best substitutes. Edited by blob2 at 14:21, 03 Mar 2015. Apparently the next expansion to Hearthstone will be Blackrock Mountain oriented (it's not official yet, but many things like data mining, or Ragnaros card back, seem to point in that direction). Plus a Magma elemental has appeared on the official site. I wonder why they choose this location and what will it add to the game. From the "adventure" point of view it seems quite interesting, as there are many bosses to fight with. Then again what can it really offer? Another Black Dragon Legendary (Nefarian), more dragons (in this case I would be glad actually ), more elementals, Geddon is already in the game etc. Ragnaros is already present so maybe Nefarian will be the final boss. What I would personally like to see in the game are Dragonspawns (they can be intoduced as a part of either the black or chromatic dragonflight). I doubt there will be a completely new mechanic. Also this does not bode well for a possible introduction of a new class as either Death Knight or Pandaren Monk don't fit here thematically. Keep in mind that those are my own speculations. Guess we will all have to wait for the 6th of March. Edited by blob2 at 18:02, 06 Mar 2015. I love it. But still the adventure is rather .. expensive.. and it will take quite a while for us non-buysers to open all the wings.. But yet again I love the way they do this.. Expansions, adventures and so on. Edited by blob2 at 20:08, 07 Mar 2015. I'm already starting to hoard the money. It's a strange feeling. On one hand it's 7 packs worth of gold, on the other your guaranteed to get some new interesting cards to strategize. And some of those cards are probably worth it, just like for instance Loatheb or Reincarnate (one of my personal favorites) from Naxx before BRM. I've got this Google Play gift card as a present from my friend who new I had a Tablet. Because I usually don't use Tablets to play games I was thinking of how to use this "virtual money"... It appears that Google Play is a great way to buy stuff for Hearthstone. I was thinking about buying Hearthstone stuff with real money for a long time now, but there were many obstacles. For one, I'm not a fan of paying for stuff via Internet with a credit card. I prefer pre-paid cards. Blizzard being very stubborn in their policy of what payment methods are allowed, does not want stuff like PaySafeCard, and they're taking incredibly long to introduce Battle.net gift cards in my country (if there's even a possibility to begin with :/). Do you guys know some good Mech Mage decks? It appears there are a lot of types, for instance more minion heavy or spell heavy. Any ideas? PS: Unfortunately this new possibility will probably be the end of me (money-wise). I'm already itching to buy more gift cards. Argh, Must... stay... strong! You... can... get...stuff for free... in this game! Edited by Minion at 00:58, 08 Mar 2015. This is what Kolento uses and many people have gotten to Legend because of it so go ahead and give it a try! This is quite close to the "standard" mech mage for what I can tell. Notice that indeed it doesn't have any draw mechanism so at some point prepare to be topdecking That is how aggressive this deck is, so pretty good for farming gold. You have Ragnaros so you could use him instead of Boom or a Pyroblast. Something to finish the game when you don't draw into Antonidas. Edited by blob2 at 10:39, 08 Mar 2015. It's pretty close to the deck I'm using. I suppose those Mad Scientists are for Mirror Entities only? I wonder how useful they really are, though trading 3 mana for the risk of your opponent summoning a weak minion justifies adding those Scientists enough (there's always this decision, play a minion or play Mirror Entity, MS helps here)... also, there's this Flamestrike option. For now I'm keeping one just in case. Though people say it fits a more defensive type of play (and Mech Mage is all about aggressiveness), it's really awkward to not include the most OP of her cards in any Mage deck. Also Piloted Sky Golem is an option here. But I still reluctant to buying any. I am thinking about buying the whole adventure pack and just have fun with it. Mirror Entity works like Loatheb in a way. At turns 5-7 it prevents your opponent from making a power play. Turn 6 Sylvanas can't be played and especially turn 7 Dr Boom can't be played. Also with the Mad Scientist it trims down your deck while gaining tempo. Just so good when it works. The problem is nowadays that people have learned to play around it very well, because Mech Mages run Mirror Entities, so I cut my deck down to 1 ME already so you should play with it and see how it feels like. But the thing here is that even when they feed you a 1 mana card it means that they didn't play a bigger minion which makes you retain board control. Edited by blob2 at 14:28, 08 Mar 2015.